I’ve noticed a subtle but significant shift that has happened to me over the last couple of years. In the last post I talked about how important it is to cultivate the hunger and thirst that God has already placed within us, so I won’t repeat much of that. The bottom line is that we should want more of God, and we should follow the thread of spiritual hunger all the way to the heart of God. The shift that has been happening to me is not a new hunger for God – I’ve been aware of that for awhile now. Instead, the shift has happened in where I most regularly connect satisfying that hunger. If you would have peeked into my life at just about any point over the last decade to see how I personally searched after God, you would find that I had only one major mode. I have grown most consistently from listening to great preaching. I’ve always been a thinker, so the intellectual realm has been traditionally where I have met God most deeply. I seemed to always have more questions than answers, and great Bible teaching was the best cure for this consistent restless I felt. So I have therefore disciplined myself for the last decade to listen to 5-7 new sermons a week. It still requires discipline – who wouldn’t rather watch TV than listen to a sermon? – but it was a discipline that came pretty easily. My heart, mind, and soul needed constant nourishment, and I knew that if I didn’t get it from the Bible I would go searching for it somewhere else. So whenever I was working out, I would listen to a sermon. Whenever I was going to take a meditation walk I would listen to a sermon. Whenever I was driving in traffic, I would listen to a sermon. Whenever I visited a new church I couldn’t wait to hear from the preacher. I am certain that this influx of Biblical knowledge has played a huge role in forming me into who I am today. And I believe we really need to know the Word of God to be able to recognize the voice of God. But with that being said, I’ve really been undergoing a big shift in how I most consistently hear from and encounter God. Whereas it used to be almost exclusively through Bible teaching, I now have an almost unquenchable thirst to meet God in worship. Whereas I used to listen to a sermon while I work out, now I only want to listen to worship music. Whereas a great sermon used to be the best launching point into a time of quality meditation, I now most crave a great song to set up my time. If I’m going to be in the car for awhile I now excitedly compile a playlist that will help transport me from the blah of bumper-to-bumper traffic and instead enter into the secret place of God’s presence. When I visit a new church I still look forward to the sermon, but I have even higher hopes for the worship time. I want (need?) help in being lifted out of my fragile, limited human place. I need help in seeing God more fully, and in delighting in the presence of God. I certainly don’t want to pit preaching against worship, because I think we desperately need them both. Ultimately, I’m not sure I’d be enjoying worship so much in this season if I didn’t have the theological foundation for understanding what it really means. But I will say this. There comes a point when we need more than new information. We need more than good life principles. What we need is to encounter the presence of God. We need to be assured of who we are in God’s good design. We need to be reminded of God’s abounding love for us, and allow that love to sneak in to all the broken and bruised places. We need to be able to bring our sins and shortcomings and mistakes into the presence of God, and like Isaiah have the angelic presence of God heal our lips. We need to lift our heads up high and catch a vision of the glory of God that stuns and overwhelms us. And I wonder if sometimes that can happen only through worship. One of the things I’ve been doing lately is picking one song that is really speaking to me, and then playing it over and over… and over and over… and over and over again… to the point that it drives everyone in my home crazy. But sometimes there’s a particular song that just perfectly captures what I am either feeling or what I need to be hearing from God. And when I find one of those songs, I find that singing it out at the top of my lungs is maybe the single best way to drive the truth down into the center of my soul. I love this post…it reminds me so much of my own journey. I’m also pretty heady and look forward to great sermons, reading Scripture, and reading books about faith. This year worship became an extremely critical part of my formation…especially as I work to recover from burnout. I’m learning to balance my doing with my being in Christ. Worship has always been awesome but there has definitely been a shift in the role that it plays in my formation. It’s a humbling reminder that even when people don’t get into all the theological ramifications of worship, God is still meeting and forming them by His very presence. Thanks for sharing! Thank you so much Tierra! I appreciate that. And sorry, i thought i had already subscribed to yours, but I for sure am now. Loved your last posts on slowing down as well! I enjoyed your article! And I LOVE the painting! 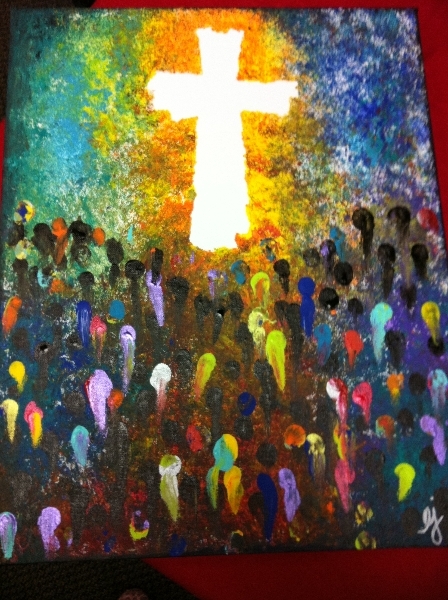 It was one I did several years ago at a youth ministry event in Arkansas. This is what worship looks like to me. I’m glad it moved you! What’s the best way to give you attribution for this? Is there a site, or just use your name?